As my wife is still a heavy user of her Zeo sleep monitor and the facilities provided by the Java viewer are not really up to what she needs, I have produced a new native viewer that provides more information than previously available. I have been developing this on and off for a few months, as noted in this post. I have had beta testing and advice, requests and suggestions from both my wife and @Jay_Aitchsee from here, and we feel that that application now provides facilities that make it more generally useful that any of the Java viewers available, such as 30 second histograms and different displays. Currently the documentation is not up to date, but there will be a quick start guide shortly and better documentation when I get the chance, although if you have used the Java viewer, the process and basic layout is similar. Obviously any feedback would be welcome, as will details of any issues that you may encounter. Hi, just tried your software on a Windows 7 machine and if I try to open the data set, which is old encrypted data that has been decrypted using the program provided in the 'shutting down' thread, but the program crashes every time I simply try to open the .dat file, with the usual 'program has stopped working' windows warning. Has anybody else had success using this with decrypted data? i.e. is it a problem with the decryption program rather than the viewer? It can open encrypted or decrypted data, although I have never tried it with data that has been decrypted with that tool, I will give it a try. I suspect it may need more protection around reading as I have only really fed it good or obviously bad data, and never checked the checksum (even though I export it). Do you have a copy of the data before you decrypted it to try on it? Really sorry that it isnt working there - I will PM you to get details of your machine etc, it occured to me after saying it worked on XP I hadn't tried it on XP in a while, as I just have 7 and 8 here, but I just tried it and it worked ok.
My old net book is still on XP, so maybe I'll give it a try on that, though unlikely I'll have time until Friday. Since I installed the java platform on my Windows 7 machine, to use the previous viewer, odd things have happened with internet explorer, so I'm not entirely convinced that something hasn't been screwed! I know we've had random app problems with one machine at work when java was updated - seems to be a rather fragile/sensitive environment! Would be great if you could produce a Linux native client (as I noticed you seem to be using Qt). Your app did; however, work in Wine on Linux. Found a problem exposed by Janes data so have done an update and updated the links. If you don't have the issue you never will, if you do, the new update will fix it. Hi, had another quick look at my data and I think the drop outs are because my sensor is on it's way out It's only lasted 3 months, so I guess I'd better sign up for the replacement headband idea rather sooner than I'd hoped!! I did notice that your data had more dropouts in it than I had seen in other data. Its not too loose and slipping of your head is it? The sensors in my wifes zeo are very old, i.e., years and still working ok. There is actually a set of results in the data for the status of the headband, but unfortunately I don't really know how to interpret it. the sensor has slipped where there are big gaps, as I remember having to move it when I woke up for the most recent one, but I don't think it has for the short drop-outs. Maybe I'll try tightening the band first, before I give up on it - I managed to get a pack of three earlier in the year, so don't want to waste one unnecessarily! Jane, I get easily 6 months of every night usage from a sensor set. You might try checking the snaps that connect the transmitter to the headband. If one is not set properly, it will result in quite erratic readings. I'll certainly check and try just tightening the band a little, but do we know what actually causes the sensor to 'wear out'? What is the wear-out mechanism? I'm guessing its a deterioration of the material that is in contact with the skin? Due to sweat/grease? Clearly I can't change the outside temperature, and being female, and of a certain age, can't necessarily do much about night sweats, but maybe I could cleanse/tone my forehead before going to bed??? Or is there any way of cleaning the material? I know the Zeo assumption was replacement, but given that's increasingly difficult, is there an option/approach for cleaning it?? Jane, I posted my response to your last questions over in the other thread. ... do we know what actually causes the sensor to 'wear out'? ... the Zeo assumption was replacement, but given that's increasingly difficult, is there an option/approach for cleaning it?? I've made several very detailed posts about the alternative of using standard disposable ECG electrodes; look for my posts 322, 284, 161. I'm not posting any more there because nobody appears to be interested. In summary, disposable electrodes work 100% perfectly. They are expensive if used once only, as designed, but it is very easy to get much more use out of them. I routinely get over 10 days per set. I made one test pulling out all the stops (except that I only renewed the gel once, I might have got more use, but the electrodes were getting scruffy anyway), and got 20 days out of one set. If properly stored (see my posts) I have had no problems with shelf life of opened or unopened bags of electrodes. At the moment I am using the electrodes at a rate of about 2 bags of 50 a year, at a discount price of £5 per short-dated bag, cheaper than headbands when Zeo supplied them. I have 7 bags left, and expect transmitter battery problems before running out (I haven't yet found any information on battery replacement). There has been a bit more on this topic on the thread cited above since I wrote the above; I think any further response or discussion belongs there, not here. Feel free to cite this text there if desired. Woodinblack, thank you for your software. It's great. I can use my Zeo again. posts 320, 282, 160. I'm not posting any more there because nobody appears to be interested. You can make you own replacement headband sensors. Thanks, that makes it worth writing! 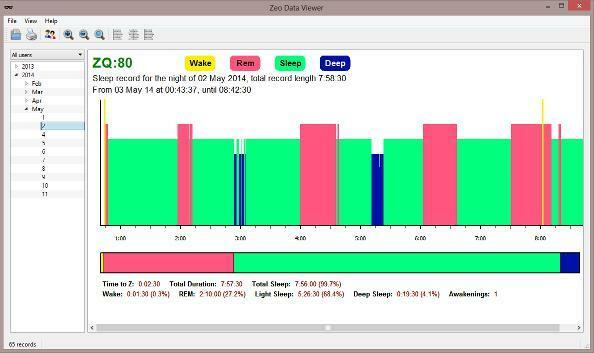 As my wife is still a heavy user of her zeo sleep monitor and the facilities provided by the java viewer are not really up to what she needs, I have produced a new native viewer that provides more information that previously available. I have had beta testing and advice, requests and suggestions from both my wife and Jay Aitchsee from here, and we feel that that application now provides facilities that make it more generally useful that any of the java viewers available, such as 30 second histograms and different displays. This viewer works great! If you have a Bedside Zeo Model and haven't yet tried it, you should! I have done an update from 0.2.1, the first public release to 0.2.3. This version adds a new section in the percentage view that shows Time To Z. For a lot of people time to Z is fairly short (mine is no time at all), but for some of us this can go on a while and creates a confusing set of stats, as if your time to z is in hours, the zeo will say you only had a short time in sleep, but the viewer will show the hours that you were awake. This is switchable like the other columns in percentage view so that you can get an overview of the columns you are interested in. Both the mac and PC versions are updated and available on my site at http://www.alienrat.net/software/zeomonitor.html but if you have the windows version you can also download just the exe and place it over the original exe. This is just a convenience to save you from a large download. If you are not familiar with doing this, downloading the installer will work fine. Let me know if you find anything wrong, or for any requests etc.